The basis for PPP is the "law of one price". In the absence of transportation and other transaction costs, competitive markets will equalize the price of an identical good in two countries when the prices are expressed in the same currency. For example, a particular TV set that sells for 750 Canadian Dollars [CAD] in Vancouver should cost 500 US Dollars [USD] in Seattle when the exchange rate between Canada and the US is 1.50 CAD/USD. If the price of the TV in Vancouver was only 700 CAD, consumers in Seattle would prefer buying the TV set in Vancouver. If this process (called "arbitrage") is carried out at a large scale, the US consumers buying Canadian goods will bid up the value of the Canadian Dollar, thus making Canadian goods more costly to them. This process continues until the goods have again the same price. There are three caveats with this law of one price. (1) As mentioned above, transportation costs, barriers to trade, and other transaction costs, can be significant. (2) There must be competitive markets for the goods and services in both countries. (3) The law of one price only applies to tradeable goods; immobile goods such as houses, and many services that are local, are of course not traded between countries. Economists use two versions of Purchasing Power Parity: absolute PPP and relative PPP. Absolute PPP was described in the previous paragraph; it refers to the equalization of price levels across countries. Put formally, the exchange rate between Canada and the United States ECAD/USD is equal to the price level in Canada PCAN divided by the price level in the United States PUSA. Assume that the price level ratio PCAD/PUSD implies a PPP exchange rate of 1.3 CAD per 1 USD. If today's exchange rate ECAD/USD is 1.5 CAD per 1 USD, PPP theory implies that the CAD will appreciate (get stronger) against the USD, and the USD will in turn depreciate (get weaker) against the CAD. Relative PPP refers to rates of changes of price levels, that is, inflation rates. This proposition states that the rate of appreciation of a currency is equal to the difference in inflation rates between the foreign and the home country. For example, if Canada has an inflation rate of 1% and the US has an inflation rate of 3%, the US Dollar will depreciate against the Canadian Dollar by 2% per year. This proposition holds well empirically especially when the inflation differences are large. Does PPP determine exchange rates in the short term? No. Exchange rate movements in the short term are news-driven. Announcements about interest rate changes, changes in perception of the growth path of economies and the like are all factors that drive exchange rates in the short run. PPP, by comparison, describes the long run behaviour of exchange rates. The economic forces behind PPP will eventually equalize the purchasing power of currencies. This can take many years, however. A time horizon of 4-10 years would be typical. The simplest way to calculate purchasing power parity between two countries is to compare the price of a "standard" good that is in fact identical across countries. Every year The Economist magazine publishes a light-hearted version of PPP: its "Hamburger Index" that compares the price of a McDonald's hamburger around the world. More sophisticated versions of PPP look at a large number of goods and services. One of the key problems is that people in different countries consumer very different sets of goods and services, making it difficult to compare the purchasing power between countries. According to PPP, by how much are currencies overvalued or undervalued? The following two charts compare the PPP of a currency with its actual exchange rate relative to the US Dollar and relative to the Canadian Dollar, respectively. The charts are updated periodically to reflect the current exchange rate. It is also updated once a year to reflect new estimates of PPP. The PPP estimates are taken from studies carried out by the Organization of Economic Cooperation and Development (OECD) and others; however, they should not be taken as "definitive". Different methods of calculation will arrive at different PPP rates. The currencies listed below are compared to the US Dollar. 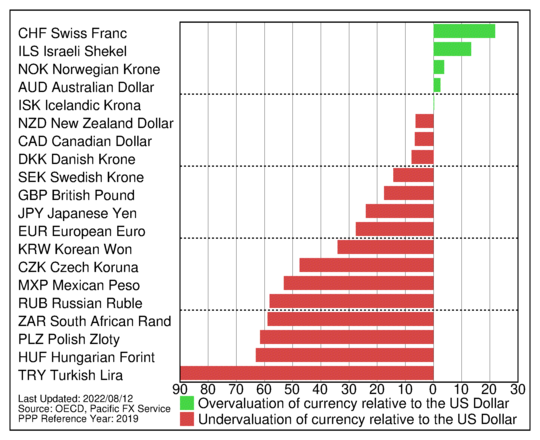 A green bar indicated that the local currency is overvalued by the percentage figure shown on the axis; the currency is thus expected to depreciate against the US Dollar in the long run. A red bar indicates undervaluation of the local currency; the currency is thus expected to appreciate against the US Dollar in the long run. The currencies listed below are compared to the Canadian Dollar. 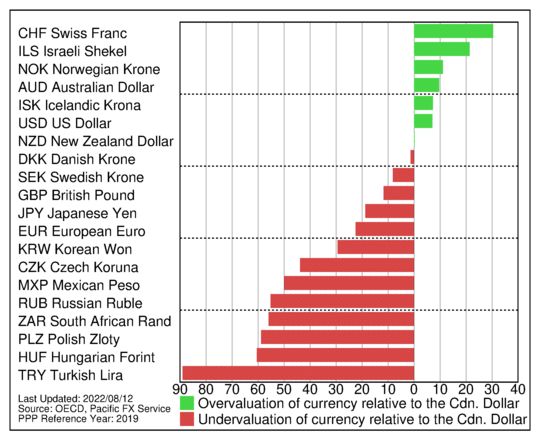 A green bar indicated that the local currency is overvalued by the percentage figure shown on the axis; the currency is thus expected to depreciate against the Canadian Dollar in the long run. A red bar indicates undervaluation of the local currency; the currency is thus expected to appreciate against the Canadian Dollar in the long run. The currencies listed below are compared to the European Euro. 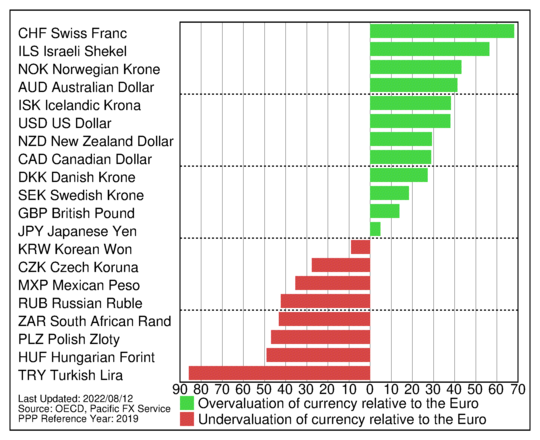 A green bar indicated that the local currency is overvalued by the percentage figure shown on the axis; the currency is thus expected to depreciate against the Euro in the long run. A red bar indicates undervaluation of the local currency; the currency is thus expected to appreciate against the Euro in the long run. • OECD National Accounts: The OECD publishes PPPs for all OECD countries. You can retrieve a table with the OECD's 1950-2015 PPP rates. This is a comma-seprated file that can be easily imported into a spreadsheet program. • From The Economist magazine: The Big Mac Index - as they put it "The world's most accurate financial indicator (to be based on a fast food item), with a ten-year retrospective on burgernomics"
• Kenneth Rogoff: The Purchasing Power Parity Puzzle, Journal of Economic Literature, 34(2), June 1996, pages 647-668. This recent survey provides an overview of developments with respect to research on PPP, including the emerging consensus that deviations from PPP do damp out but only very slowly, at roughly fifteen percent per year. It remains difficult to explain why the estimated speed of convergence to PPP is so slow. • For the more technically minded, I recommend searching the EconLit database for recent research papers on PPP. This is a very active branch of economic research, both theoretically and empirically. © 2016 by Werner Antweiler, University of British Columbia. All rights reserved.